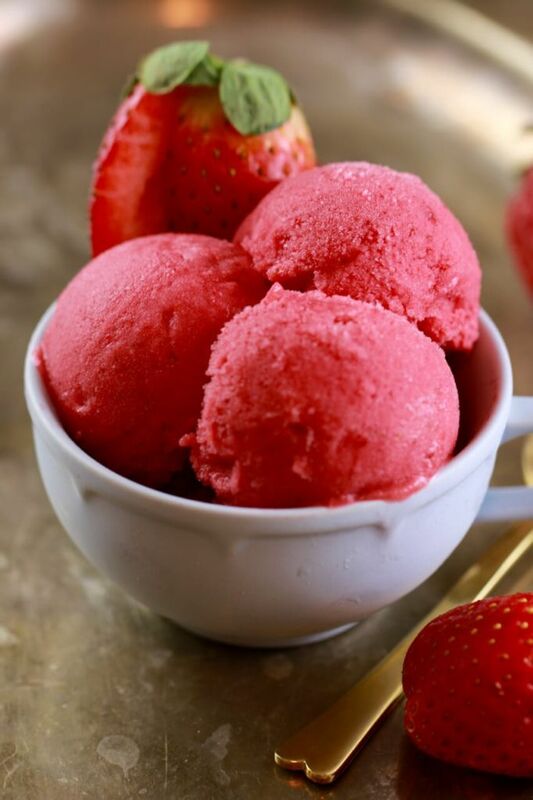 With fresh summer strawberries, a touch of honey, and no ice cream machine required, my all-natural frozen yogurt recipe is simple perfection. There are few things as refreshing as frozen yogurt on a hot summer day. Although many yogurt shops offer delicious fro-yo, they often come with unnecessary artificial sweeteners and flavors. With my simple homemade frozen yogurt, you’ll get the same great taste with all-natural ingredients. My strawberry frozen yogurt recipe contains just four essentials: Frozen fruit, yogurt, honey and a squeeze of lemon. No need for additives – this mix contains only natural sugars that come from fruit and honey and is one of my favorite frozen dessert recipes. This healthy treat is wonderful if you’re looking to lighten things up and cut down on the extra calories. My homemade frozen yogurt could not be simpler to whip up. Add your favorite fruit and the remaining ingredients into a food processor, blend until smooth and freeze! Easy peasy. My recipes are triple tested so I guarantee smooth, scoopable and delicious fro-yo bliss. Homemade frozen yogurt can be made with whichever yogurt you prefer. I use Greek yogurt as it is higher in protein but regular yogurt will do just as well. When deciding on a yogurt, my recommendation is to use plain yogurt with no added flavor. Frozen fruit is important for this recipe, and a good quality pack of fruit will provide you with a creamy and smooth blend. Frozen fruit is typically less expensive and packed in season, so don’t feel limited to seasonality. For this recipe, you can never truly go wrong with the sweetness of good strawberries. To give your frozen yogurt the same sweetness and scoop-ability as the ones you’d find at a shop, honey is the answer. Liquid sugar keeps ice crystals from forming in your frozen yogurt, and honey is a great all natural sweetener that will keep your mixture from hardening too much in the freezer. For dairy-free or vegan frozen yogurt, swap out the honey for agave and use a dairy-free yogurt like coconut yogurt. GET MORE FROZEN YOGURT, ICE CREAM & FROZEN DESSERTS! Weight Watchers Points, Smart Points, and Nutritional Information are included in the recipe below. Add the frozen strawberries, honey (or agave nectar), yogurt and lemon juice into a food processor (or liquidizer). Fresh berries can be used in place of frozen, however the fresh strawberries must be frozen solid. Hi! I am looking to make an ice cream bomb for my daughter’s birthday and am wondering if this fro-yo would work well if thawed soft enough to create the layers of the ice cream bomb? It seems like a healthier alternative than using sweet condensed milk with ice cream, just thought I ask before I try it this weekend. Thank you! Yes it absolutely will work for a bomb. Hope she likes it. Hi, yes you can. Or you can use Lakanto sugar sub. I did it with the honey and it turned out great, could barely taste the honey (i don’t like the taste of honey that’s why i asked if I could use sugar instead). Unfortunately my husband finished it before i could get a picture. Thank you again. I am happy that this worked well for you. There are different flavors in honey too, usually a light colored liquid honey will have a lighter flavor too. Hi Gemma! Love your recipes! I have a question, can I use Low Fat yogurt? Yes, you can use any kind you like for this recipe as long as it is thick, enjoy! I have been trying to find out how to make Yellow cake batter yogurt. Do you have the recipe to share? Thanks! Hi there, i dont at this time, but any recipe that calls for buttermilk can usually be replaced with yogurt. I hope that helps! In my excitement I kind of put triple the quantity of lemon juice and trying to make up for that mistake, I have literally water half a tub of honey and it’s still tasting as lemon.. for future reference how can I correct this. Hmm in future i would pre-measure the lemon juice ;D Thanks for the lovely message! I just saw your strawberry yogurt and I wanted to know do you have to strain the bought Greek yogurt before you use it? I live near a strawberry farm which sells seconds of its strawberries meaning you have to eat them within a day or two as I thought this would be great for me their strawberry yogurt sells for $9.00 for a tub the size 420ml which I ate in two days then I thought maybe there is someone who knows how to make it, thank goodness its so simple too. I will be looking at other recipes which I like doing easily as I’m not a cook. good for you, and a great way to use up the available fruit too. No, you would not strain Greek yogurt. Greek yogurt is already strained. Check the pack in your store, the correct one does not have to be Greek, but some Greek Style yogurts are strained, and some are set. You need the strained one. It will tell you on the pack. I have a few more ideas for your strawberries here (https://www.biggerbolderbaking.com/?s=Strawberry). Have fun, you will be a cook in no time at all! I hear you, though I am not too comfortable with your tone! Here is my recipe for homemade yogurt (https://www.biggerbolderbaking.com/how-to-make-yogurt/) and you can of course do this. In order for this to freeze well for you it will need to be strained, as Greek yogurt is. That means allowing it to strain through a sieve, lined with a cheesecloth, over a bowl in the fridge overnight, or for about 8 hours. Here on Bigger Bolder Baking we try to cater for all levels of experience in baking. For you the short cuts may be a bridge too far, for other people it may be the beginning of their baking life. Hi I have exactly the same problem it sets rock hard and have to allow it to soften for about 45 minutes before I can scoop it out. Sorry to hear that, Yes that is frustrating. Adding more of the liquid sugar will help it be a little more stoppable. When you say liquid sugar do you mean honey? Yes bruce, honey or maple syrup. When you say ‘Full Fat Greek’ yogurt is it a strained yogurt or a Greek Style set yogurt? This makes a difference too. The higher the water content in a food the harder it will freeze, but usually the frozen berries will ensure that the ice crystals are suspended in the froyo. I was really excited to try this recipe but the result was somewhat disappointing. 🙁 It was tasty but it was sooo hard!! I made it a second time, this time I added more honey, and a little more yogurt as well, I also skipped the lemon(I found it too sour the first time). My mom also recommended that I stir it every hour in the fridge. The result was better than the previous one, (it was scoop-able) but it was nowhere near creamy, i could actually feel the crunch in every bite. Hi! It’s always good to follow a recipe exactly the first time and then adjust per your taste. One of the tips, I give is to take the yogurt out of the freezer prior to scooping so it becomes a bit softer. That’s what I’d recommend next time. No stirring needed, just make sure you whip up the recipe in your food processor enough to get a smooth consistency. Do let me know if you try it again. I make my own yogurt. Mixed with this recipe it comes out with a nice tart flavor which I love. i start it on a medium setting, and then up the speed, but it depends on the fruit/ingredients. My blender is very high powered. I posted a few days ago. Couldn’t figure out how to just reply. Strange. I was going to try using Splenda. It worked great! I think the first batch was a bit heavy on the fruit side. Should have measured. The second batch, I measured. I liked the first batch better though. Both were good. I use Fage 2%. It might have been a bit heavy too. It’s a really rich greek yogurt. Just today, I strained raspberries to get the seeds out, froze the puree in half filled ice cube tray. I also had some strawberries left. So, I just mixed the two fruits it tastes good. Really fruity. Cant wait till it freezes. I’m going to also have to try other fruits, like the last person did. For an ice cream freak such as myself, one who needs to try to do low carbs high protein, this is perfect! Thank you so much for posting this. Now, I’ve got to see about getting a food processor! I have been trying and enjoying your frozen yogurt recipes. So far, I have made mango & lime, banana & chocolate, strawberries, berries (blueberries, raspberries, blackberries & strawberries). All these recipes turned out great and were enjoyed by my family. I even made my own oreo cheese cake frozen yogurt. I took your recipe for cake batter and substituted the sprinkles by 6 crushed oreo cookies. It was just devine…. Thank you for sharing your recipes ! You are really a Bold Baker! Well done you. Thank you for sharing these ideas with others, it always inspires confidence when it comes from one of you guys. Just saw your recipie todsy while I was in the ice cream section of the store. Instead of ice cream, went and picked up a carton of strawberries. They’re freezing now. I’m going to try it with using splenda in my greek yogurt instead of honey. I’m supposed to do low carbs to loose more weight. Hopefully my blender will handle it too. I did see that others said if s blender. To try doing smaller batches. We shall see how it works. about the honey … mine keeps freezing up when I add the frozen fruit .. should I add it after I blend the fruit ..would that help ..
welcome to the Bold Baking community, it is good to have you with us. I tend to add all of the ingredients at the same time. You could add the honey to the yogurt before you add it to the frozen fruit, I think this will also help. Can I use more yogurt? Like a cup of yogurt for the same recipe? yes, but it is important that it is a strained yogurt. Greek/strained, not a set yogurt. I have a big Ninja blender – can I double the recipe and use other frozen fruit ? Yes, I cannot see any reason not to do it, what matters is that the blender can break down the fruit, you may need to do it in batches. Yea! that is great, thank you for letting us know. Poor you, you have a job for life now! I made your strawberry frozen yogurt & just now made the banana/chocolate recipe in my food processor. The issue I had when making both of those recipes was that the honey does blend in because of the ice cold ingredients & remains on the bottom of my processor bowl. I had to scrape it out & then try to incorporate the cold globs of honey into the mixture. I get it! The thing to do is to incorporate the honey into the yogurt before adding to the processor, that will do it for you. Gemma thanks for your reply. Sounds good! Hi Gemma, your recipe is great, just a query can I blend it in a blender?? The issue is with the space in the jug to do the job, a small amount would work, but it may struggle with a larger amount as it thickens. This recipe broke my blender 🙁 It’s not even that it struggled and the motor burned out, it died pretty much as soon as I switched it on. I’m a novice at this and now know that blenders can’t handle large chunks of frozen fruit. Next time I will chop fresh fruit into small pieces before freezing. Made this last night. So simple and tasty! Used some mixed frozen berries I had in freezer instead of just strawberries. it came out quite seedy (due to raspberries and blackberries) so maybe I’ll try straining it next time. Yes, that is the issue with frozen summer fruits. Straining the seeds out will be tricky, as it will have to be done after mixing, and before it becomes too liquid, as it will freeze really hard if it becomes to liquid. Thank you for this, we may get a suggestion from another Bold Baker! Hi Gemma, does it work well with Honey greek yogurt? Good. So that i can skip the 2 tbsp honey on your recipe and just use the honey favour greek yogurt. Hi! What is the serving size for the frozen yogurt? This whole recipe will make about 1 1/2 pints of frozen yogurt. Thank you so much for this recipe. My partner is in the advanced stage of dementia and has trouble swallowing. So when we came across your recipe we decided to give it a try. The creamy texture and fresh ingredients not only taste delicious but they bring a smile to his face. Thank you so much! I’m very sorry to hear that. What a horrific disease. I’m very happy they are still smiling. Let me know if there are any other recipes you are looking for. Thank you for your great frozen yoghurt recipe. I wondering why fresh berries can be used but strawberries must be frozen first? Can I use other fresh fruit like dragon fruit/manggo/lychee or I have to frozen them first? If I use fresh fruits, will it change the froyo texture after freezes ? If you mix a juicy fruit into the yogurt without it being frozen it will freeze hard, like ice. Freezing the fruit suspends the ice crystals, and breaks them down when processed with the yogurt, it will be a different thing. It would work well as an ice pop/popsicle! What if I have a family member who prefers plain yogurt with fruit ONLY as his toppings, and just won’t have it any other way lol.. Would this recipe work if I skipped the 2 cups of whatever fruit, and only used the yogurt, honey, and lemon? Would it freeze just as well? I know what you mean for for my frozen yogurt you need the frozen fruit. Thats the only way you can make it without an ice cream machine. The fruit is one of the largest ingredients. Can I use maple syrup instead of honey? Will the quantity remain the same as for honey in case I can use it? I’m lactose intolerant, so I used Cashew yogurt. It needed a little extra yogurt and honey to come together, then it was perfect! 15grams of sugar per serving….is that correct? It seems like a lot… anyway to reduce that? I suggest that this recipe will serve 4. 1 tablespoon of honey, is 3 teaspoons, 15g. There are two tablespoons in this recipe, which is 30g divided in four, about 1 1/2 teaspoon per serving. The sugar/honey/agave has a purpose too ni keeping the sorbet fron freezing too hard, just as the frozen berries will help suspend the ice crystals. You could try it without sugar if you wish, and if it suits your taste, happy days. Do use a strained/Greek yogurt, water is the enemy! Most of that sugar is natural, from the fruit. I’d estimate, based on 4 servings, that each one has about 8 grams of added sugar (at least using honey). The rest is perfectly fine to eat. Hi gemma! Wow i have the greatest yogurt from your recipe. Now can i use this to makr your frozen yogurt? Just wondering why you did not suggest using your homemade yogurt. Thanks as ever grateful to you! The yogurt used in frozen yogurt needs to be a strained/Greek yogurt. that means another process for the homemade one. What you are trying to achieve is a low water content, so that the froyo freezes without becoming too hard, as water of course freezes like ice! So, yes, you can certainly use any natural yogurt, but you will need to strain it. This means pouring it into a sterilized cheesecloth/j-cloth, in a sieve, over a bowl, in the fridge overnight. The water (whey) will drain away, and you will be left with a really thick yogurt. This is what you will use for frozen yogurt. This is what Greek yogurt is! When you buy this in your store you will see one labeled ‘Greek style’. This is often thickened natural yogurt, and is not what you need for froyo. The important onrd is ‘strained’ so that you will know it is naturally thickened. Gemma yes bht i have been passing your yogurt aa greek. And the frozen yogurt with frozen fruits do not harden like water at all in freezer. Been enjoying it. Today i did papaya and banana. No need for sweetener. So good. Enjoying you! Oh and so youre online lovers. Have a very good friend filipibo who alsomarrued her american online match. 13 years now and still living happily ever after. that’s great, I’m glad to hear that. We are having a heat wave so I improvised your Strawberry Frozen Yogurt receipe using what I had on hand….frozen blueberries, lemons from my tree, honey that would barely come out of the bottle, and yogurt (skimming off the extra water) and it turned out to be the perfect dessert to help survive the heat. I put two small cartons in the freezer for another day! I had thought of going out and buying a dedicated yogurt/ice cream machine and I am so glad I didn’t because the food processor works great. I don’t need another gadget to clutter up the kitchen. Thanks a million for inspiring me to get creative and plan to make many more of these wonderful desserts. I though i responded to this in the lat few days, but I will do so again in case it did not go to you. Thanks for your thoughtful and kind response. We ate the extra dessert that was stored in the freezer today. I put it back into the food processor with some extra yogurt and it tasted even better than the day I made it! Heat is subsiding but is still in the 3 digits but not as high as yesterday which was 114! Very unusual for Northern Calif. Bay Area. I lived in San Francisco for some time, and really never saw those high temperatures there! Relax as much as possible during this time, it will pass!! Can you leave out the lemon juice? Yes, brogue it is, go hiontach, as we might say, perfect! thanks, Gemma! btw, i used 1/4 tsp of lemon extract, but didn’t even detect it in the flavor of the froyo, so now at least i know i have some leeway to play with the amount of that flavor anyway. i only have a blender, but the comment section helped a lot to prepare & avoid any great difficulties with the processing. i cut up the frozen berries beforehand, & mixed the honey w/ the Greek yogurt & extract in a separate dish. should’ve put the wet ingredients in first, but it just meant that it took some extra time to stop & keep stirring from the bottom of blender w/ a utensil. hard on me physically to have to stand & do that, but will plan even better next time. the result was still delicious, & look forward to making more of it & experimenting w/ other fruits — & chocolate! “the sky’s the limit”, right? You are right, and the flavor of the extract is a lot milder than the juice, but good job! The blender is more of a challenge, but when you manage it as well as you did it is perfect for the job. I tried so hard make frozen yogurt, and what it’s doing is just turning to a block of ice. What am I doing wrong? you can freeze any yogurt really! If you like you can add some honey for sweetness. greek/strained yogurt will work best as it is lower in water content. You may need to allow it to stand at room temperature for a time to soften it before eating, or eat it like an ice pop. It is entirely possible! No! Greek yogurt is lower in ‘water’ content than regular yogurt. This allows it to freeze soft. You can make popsicles with it! Hi Gemma – I’m a bit confused… you say that the calories are only 4/serving but the total calories in the recipe add up to about 252. That number divided by four is 63, not four. Am I figuring something incorrectly? Thanks! Hmm, Lynn I’m going to have to look into that. I use myfitnesspal.com to calculate the nutritional value so I’m going by what they say. I’m have to double check. This looks like a really great recipe, but I wanted to clarify whether using regular blender for this is fine. Hi Gemma. Do you think I could use vanilla yogurt and withhold the sweetener? Thank you so much for this recipe. My sister and I didn’t have enough strawberries, so we used some raspberries. It turned out great! Thanks again! I am so happy to hear this! I never thought of the basil and strawberry idea! it sounds delicious, I can see how it would work. It is really good to have you with us, stay tuned for more ice creams today! Is it possible to make this without any fruits? What will the ratio be like? Do you mean frozen yogurt, with just the addition of the honey and lemon juice? Ya, i meant frozen yougurt. I tried out without sweetener. It turned out icy. Sweetener can it be like more honey? The only issue I had with mine was that it froze too much and wasn’t scoopable. Was it because I didn’t use the liquid sugar? If so how much do I use? This would help! follow the recipe. Which fruits did you use? this really matters. the higher the water content of the fruit the harder it will freeze, like ice really! Frozen fruits work well too, as the ice is suspended before you mix it. Regular yogurt is really high in water too, Greek yogurt is a strained yogurt, the water is removed, so it freezes in a different way. So many ways to get it wrong! Yes, but not my two ingredient ice cream, it is not necessary, and it would not work! Usually the instructions for your appliance will give you an idea of what works really well in the appliance. If you mean the frozen yogurt then you can probably use the nutribullet, but check oyur instruction book!. I tried out your recipie, but I only made a half batch, and used blueberries instead of strawberries. It turned out smoothie like after blending, and I froze it for one hour. When I went in to scoop it, it had consistency similar to Gelatin! It was really fun to eat, and it tasted great too! Do you think you could tell me why it was gelatin like? P.S. Love your show! yes my blueberries were frozen, and I only processed it until it was combined. Luckily, it still tasted good! I just finished your ice cream class and learned a lot! I just want to know how to make traditional strawberry ice cream. Sorry for my late replY. I’m thrilled you liked my class, thanks so much for taking it. So strawberry is really easy. Cook all of these ingredients together for 5-7 minutes and then puree. Make the vanilla ice cream and just as it has churned (or if it’s no machine it should be all whipped up) fold this cooled mix into your ice cream. It also works great with raspberries. Can we skip or substitute lemon juice with lime juice? Thanks! what can you use instead of yoguart?? can you use milk instead of yogurt??? thank you!! No! but you can make your own yogurt!